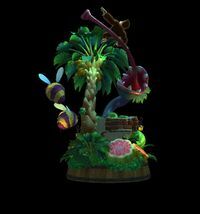 Juicy Jungle is the fifth world of Donkey Kong Country: Tropical Freeze. The world is opened after defeating Fugu, the boss of Sea Breeze Cove. Bashmaster serves as the boss of this level. As its name suggests, the world takes place in a fruity jungle area, where fruits can be harvested. Large berries and fruits, along with spiked variants, act as obstacles and platforms, either hindering the Kongs' way or helping them. Fruit juices form pools that Kongs can swim into, allowing them the further exploration inside them. Some variants of Snaggles seem to live inside the juice pool. Another striking feature is the factory inside the jungle, which is used to process the fruits they harvested and make fruity snacks such as jelly and popsicles. Jellies are used as a trampoline to spring, while popsicles and frozen fruit juice blocks serve as platforms or obstacles that can hurt Kongs. Fruit cutting knives, fruit crushers, mincers and other sharp objects serve as deadly obstacles in this world. Other than Snowmads, enemies in this world are heavily focused or based on fruits and berries, such as Bouncelisks and Toucan'ts. According to pictures in the art gallery, this island is the homeland of Professor Chops and his people, who established and operated fruit factories under Snowmad surveillance. In the game, the factory appears to be entirely automated. World 5-1 Harvest Hazards The level showing how fruits in Juicy Jungle are harvested. The Kongs would have to avoid wooden claws picking up spiky berries from trees. Buckies and Bouncelisks are common in the level. World 5-2 Reckless Ride The third Rocket Barrel level in the game, in which the Kongs are prompted to survive an onslaught of giant berries and knives. A Speedy Tucks operating a machine with extendable claws also forms an important obstacle in the level. World 5-3 Fruity Factory The stage in which fruit are first seen processed. Series of cuboid watermelons and citrus-like fruit that can be used as platforms are driven into cutting mechanisms, which are to be avoided. Chompasauruses are first encountered here. World 5-4 Panicky Paddles A long level taking place both overworld and in pools of juice. Above the juice, fruit are attached to rotatable panels and carried across graters. Inside, there are numerous spiky berries and spinning blades that occasionally interfere with each other. Toucan'ts are introduced in this level. World 5-5 Jelly Jamboree A level that focuses on bouncing jelly blocks. There are three types of jelly blocks within the level, each having distinct properties. World 5-6 Frosty Fruits A level set inside an icy fruit storage, where big popsicles are used for platforming. Among the latter, there are also machines stocking piles of red blocks, threatening to crush the Kongs, and also sharp drills coming down from ceiling tunnels. World 5-A Beehive Brawl A beehive level that is centered on Buzzies, which live in suspended huts. World 5-B Jammin' Jams A level featuring spiky fruit crushers as its main hazard, along with numerous extendable platforms lying above spikes. Lemmingtons are particularly common in this level. World 5-K Platform Problems The fifth Hidden Kong Temple stage in the game. It is littered with platforms moving along metal tracks, either automatically or under the Kongs' weight. World 5-Boss Punch Bowl The fifth boss fight of the game, in which the Kongs confront Bashmaster, the Unbreakable. The following is extra content that can be unlocked in Juicy Jungle. The unlockables can be seen in their respective galleries after selecting the "EXTRAS" option. For a full list of extras in the game, see here. A soundtrack selection for this world can be unlocked after beating Bashmaster, the Unbreakable. Swing Juice - Plays in Harvest Hazards, Panicky Paddles, and in the starting and ending sections of Reckless Ride. Juicy Groove - Plays in Fruity Factory. Fruit Bounce - Plays in Jelly Jamboree and Beehive Brawl. Frosty Fruits - Plays in Frosty Fruits. German Marmaloupe Portmanteau of marmalade and cantaloupe. This page was last edited on March 23, 2019, at 12:59.